I feel like I haven't done one of these wishlist posts for absolutely ages (slight exaggeration there Chloe... it was only October) so I thought I'd share with you some of the beauty pieces I want to get my hands on. My expensive taste seems to be showing here as all bar one of the products are high end so I think I need to start saving my pennies. 1 ~ Sleek I Divine Eye Shadow "Au Naturel"
I have fallen madly in love with the Sleek palettes. Literally. I have the "Oh So Special" palette and it is my most used palette. The shadow lasts all day and the colours are stunning! The "Au Naturel" palette contains lots of lovely darker shades which I think are perfect for the winter months we're in now. I also find that the Sleek palettes are so cheap yet still as good if not better than some of the more expensive palettes around. Soap and Glory is one of my favourite brands. I absolutely love their bath and body products and they always work wonders on my skin. The "Peaches and Clean" cleanser seems to be a really popular cleanser. I've heard so many fantastic reviews about this product being great for clearing up the skin and preventing future breakouts, and as someone with dreadful skin, that sounds amazing! I've been on the look out for a skin clearing foundation for the last few weeks, as I feel that even though my Rimmel Match Perfection foundation provides a good coverage and doesn't seem to cause anymore breakouts, I'd quite like a foundation that helped to clear up my skin as well as cover it up. This foundation is quite a bit more expensive than I normally pay for my makeup but based on some of the amazing reviews I've read about this product, I think it's worth it. This seems to be one of the most talked about makeup brushes at the moment, especially by bloggers and youtubers, and I'm constantly hearing amazing reviews about it so I really want to see what the hype is about. I've never tried any of the real techniques brushes before but I'm on the look out for a new fantastic face brush and based on what I've heard, I think this little beauty might be perfect. I haven't tried any of the benefit face products before but I absolutely love some of their eye products so I thought I'd give this a go. I'm always on the look out for a good concealer as it's one of my staple makeup products and it was the 'industrial-strength' element of this that caught my eye. I find I always get worried about whether or not my concealer is still covering up all my blemishes (even though 99% of the time it is - good old Rimmel wake me up) so to know that my concealer is going to stay on all day whatever would be so lovely. 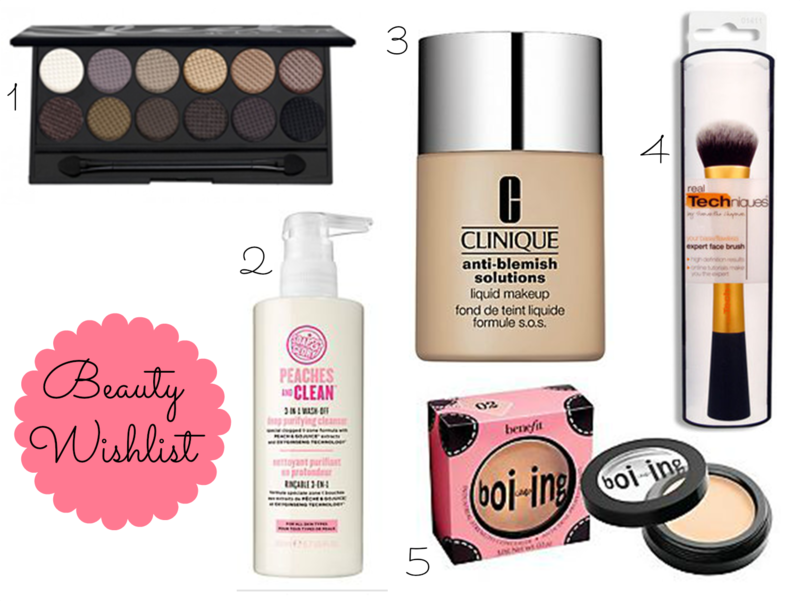 What's on your beauty wishlist this month?